This website shows you how to use Japan Rail Pass. But some of visitors have a plan to buy a single ticket. Even Japan Rail Pass user need to pay a single fare when they want to save the pass. So I would like to share the useful links and the information with you. JR fare rule is so difficult to understand for the tourists from overseas. Even some travel agents in Japan do not understand this rule completely. I show you other simple fare tables below. But these fare tables show you a simple round trip or one way trip only. If you need to calculate for multi-city itinerary, you need to understand JR rules. I wrote about fare rule very simply at the post, For non JR pass travellers. 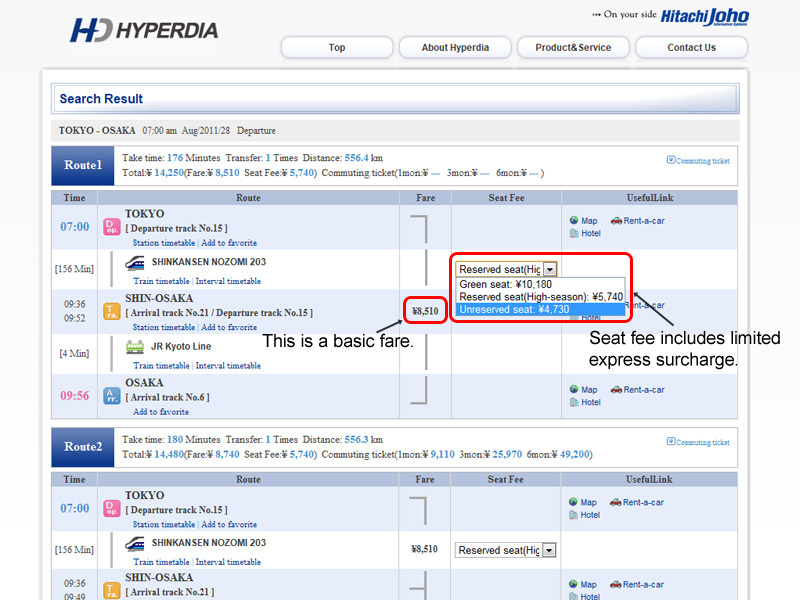 Guide to use JR single ticket, basic rules, validity and stopover. You can get an information about purchasing and using single ticket. You can find a single fare and surcharge for most of limited express trains in JR East area (Kanto and Tohoku regions), Hokkaido and most of Shinkansen lines. This website offers you the fare table of Tokaido and Sanyo Shinkansen. This website offers you the fare and timetable of many of JR trains. This website shows you the fare table of most of JR Shikoku lines. This is the first backpack trip for both me and my fren. We are planning a trip to Kansai area from 3/22 to 3/29 as below, but we’re cracking head on what transportation we shall take for the whole trip, could anyone help to advise? Would be much appreciated. Thank you. 22-Mar Kansai Airport >Kobe ==> Thinking to transfer by Bus direct to Sanomiya station and buy Cityloop bus tickets to walk around Kobe. We live in Kobe at that night. 23-Mar Kobe> Kyoto ==> Is Kintetsu railway 2 days pass suitable to transfer from Kobe to Kyoto? And use in Kyoto to visit North side & Arashiyama ? We live in Kyoto at that night. 24-Mar Kyoto> Kyoto ==> use Kintetsu railway 2 days pass, visit Eastern Kyoto Full Day? 25-Mar Kyoto> Nara> Osaka ==> Transfer from Kyoto to Nara for 1 day trip then move to Osaka at evening. What is the pass/ transport suitable to use? Kansai thru 1 day pass? We live in Osaka, Namba area at that night. 26-Mar Osaka> Osaka ==> We had bought Osaka Amazing 2 days pass. 27-Mar Osaka> Osaka==>We had bought Osaka Amazing 2 days pass. 28-Mar Osaka (Namba)> ==> Will walk around Shishaibashi & Dotonbori area, to travel a limited places around, what should we get to travel to there? Kansai Airport==> Plan to take Nankai Line fronm Namba Station to Kansai Airport. I recommend you to use Kansai thru pass for March 23 to 25. Kintetsu rail pass does not cover Kobe and city transportation in Kyoto. Please see the link below to find more info about Kansai thru pass. Osaka amazing pass is okay for these 2 days and you don’t need any deals for the last day of your trip. I’m planning to go to Japan on Tokyo with my boyfriend from March 15 to 30. Could you recommend us a pass that suits us? I think the 14 day JR Pass may suit us but don’t know if there is any cheaper option or if it really is the best in money saving. I’m not counting the narita express fare as if I buy the 14 day, won’t be using it the day of arrival and day of departure. Could you please give me your recommendation? You may use 14-day JR Pass. But I recommend you to start using on day 3. Asakusa and Skytree cannot be accessed by JR pass. Please see the link below to find the info about train in Tokyo. If you arrive in early morning on day 1, you can go for 48 hours version. Otherwise 24 hours may work. And you can take Narita Express on day 16. JR pass does not cover whole part of your trip. Please see the link below and read carefully at the chapter of “How to use JR pass in major cities and tourist spots”. Could you help me to give adv, should i buy JR Pass? Day 9 : Departure Narita Airport. Hopefully you can advice us in getting the most worth it option? Or maybe do you have other suggestions? I found your website very informative and you provide very good details information. GREAT JOB! I was thinking if you could help to give some advice for the travel pass (JR pass and city train deals) for my wife and I itinerary starting from the 23Dec-7Jan. As this is our first time to Japan, we are a bit confuse if we could use the JR pass for within the same city travelling via train/ bus (by JR group) or this is just for intercity travelling? If you could shine some lights on this would be great! You may use 14 days JR pass for the first 14 days of your trip. You also can find the info in the link above Tokyo for day 15 and 16. Appreciate for advice cos i want to buy JR West Pass and ICCOCA. I recommend you to use Kansai one pass and Haruka, Tennoji version. You can take Haruka from KIX to Tennoji and local train to Universal city. This trip is covered by Haruka portion. You don’t need to use Kansai one pass. After you arrive in Universal city, you will use Kansai one pass for all trips until day 4. On day 5, you will use Kansai one pass to get Railway Museum. But you can use Haruka discount ticket for Kyoto to KIX. While staying in Tokyo, we will be checking just surrounding areas (within 30 minutes train radius). Do you think that we need a JR pass, or is it better to purchase train/bus tickets as we go? JR pass is not required. Please see the link below to find the info for your trip. Can you advise whether the JRail pass is needed or is there a cheaper alternative? You may use it for the first 7 days and use other deal for the rest of day in Tokyo. My name is Sambika, and with my brother we are going to be in Japan from the 14/04/18 to 30/04/18!!!! I was reading through your blog and I find your post on the transport subject really informative! So I thought you could give us advice on choosing the best ticket to travel around Japan! We are trying to sort out which Pass will be more suitable (and the cheapest) for us. We are flying to Tokyo (I will arrive in Narita and my brother in Haneda) and we are flying back from Osaka. We are planning to visit Tokyo – Fuji 5 lakes – Kyoto – Nara – Osaka – Himeji – Hiroshimo – Miyajima. Having book some activities we are unfortunately left with some restrictions. My question is what would be the more profitable pass for us : JR Pass 14days ? JR Pass7 days ? JR West Pass + additional tickets? I find the 14days pass really expensive and I am not sure if it would be profitable for us even though it will give us a lot of flexibility …what is your opinion about it? What do you think about this planning? Personally I’m not convince myself because it requires some back and forth travel + I don’t think it’s really convenient for booking the hotel…. I thing at the end this come back at the same price (maybe even slightly more expensive) as the JR Pass 7days but not totally sure about this…. Hopefully you can advice us in getting the most worth it option (14days/7days/JR West)? Or maybe do you have other suggestions? If you use JR pass, you can do as you planned. There is no deals to cover Fuji Five Lakes. You may use the deals in the link below even if you use JR Pass. You need other deal after JR pass expires. Bus + Kansai Hiroshima area pass may be slightly cheaper. And you can save one night accommodation. It makes the total cost be cheaper. Thank you very much for your reply Takeshi, and for the useful link!!! The actual name of the pass I was referring to is JR Sanyo Sanin area pass sorry for the confusion….I checked again the conditions and we should have access to the reserved seat option. So do you think the JR Sanyo Sanin area pass is better then the JR Pass for 14 days ? or should we take the JR pass 14 days? You should use JR pass 7 days from the day to go to Fuji Five Lake to Kyoto. 14 days pass is not your choice anyway. JR pass 7 days is better choice than Sanyo Sanin area pass. Great thank you very much for this useful information and advice! No worries, Arun and Sambika. I’m arriving in Osaka for a 7 days trip in September. My basic itinerary is Osaka-Kyoto-Lake Biwa-Yokohama-Tokyo(Airport). We will arrive in Osaka and depart from Tokyo. Will the JR pass work for me or is there any other suitable pass? Thanks so much! We are planning (2ppl) a visit to Japan in Aug 1 – 14. Whiles staying in Osaka and Tokyo we would be visiting the near by Cities/Areas. Do you think that we need a JR pass or would normal day to day purchase do. Single ticket is okay for Chiba.